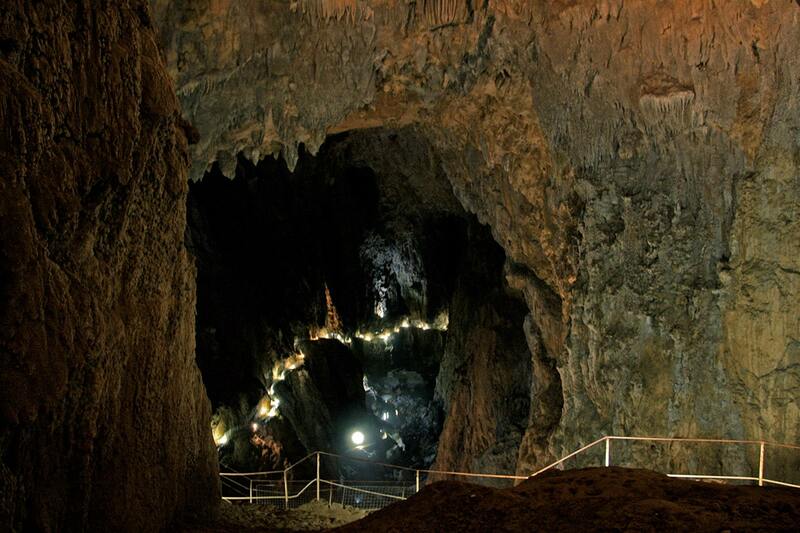 The giant Škocjan caves belong to the most interesting caves in the world, with several exceptional qualities. This magnificent natural landmark has served as a cult site for several millenia. In the border regions of Italy and Slovenia is located Karst plateau formed by a 300 m thick layer of Cretaceous and Paleocene limestone. 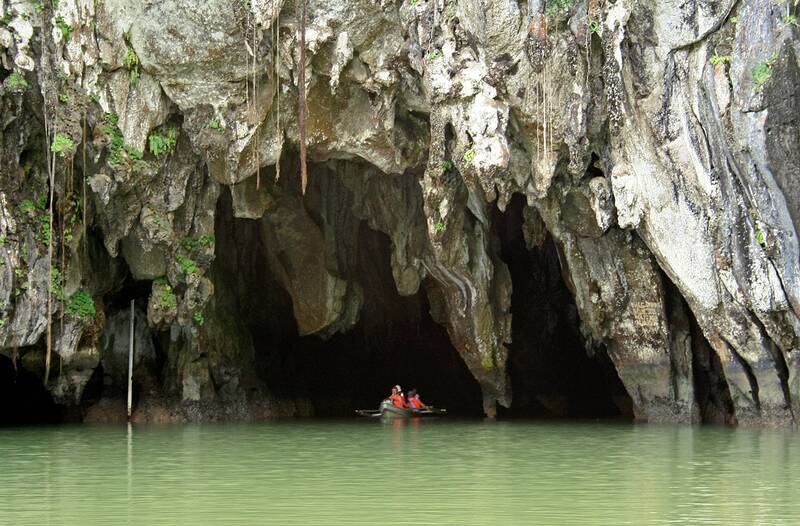 This enormous limestone mass is criscrossed by caves, sinkholes, river canyons and other specific relief forms, shaped by groundwater in the comparatively well soluble limestone. The name of plateau – Karst – today is used all over the world to describe geomorphological forms shaped by the dissolution of carbonate rock. Škocjan caves are formed by river Reka (reka is "river" in Slovenian). This is amazing river with few analogues in the world – in Škocjan caves it disappears and thus far no one is sure how it reaches Adriatic. River starts in Snežnik Plateau and flows on the surface for some 55 km. When it reaches Karst, the river enters in a 100 m deep gorge – the largest blind valley in Europe. 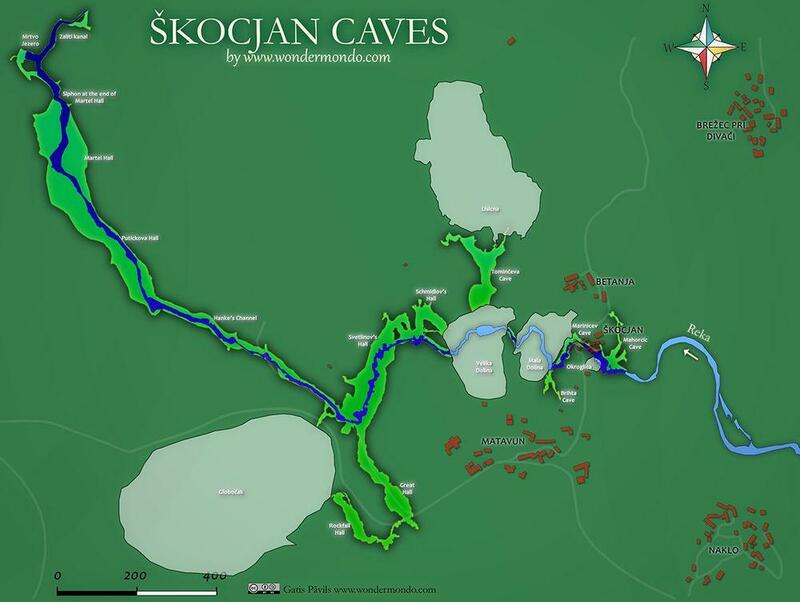 Reka disappears underground in Škocjan caves and it is not certain where it reaches Adriatic. It is well possible that the powerful Timavo spring in Italy, 34 km from Škocjan is resurgence of Reka. Timavo springs form a sizeable stream, which after 2 km enters Adriatic. Reka disappears underground just before Škocjan village, in Marinicev cave. One can look on this stream though narrow, 116 m deep sinkhole – Okroglica, which is located near the centre of Škocjan village. Some hundreds of metres further river comes to daylight again when it flows through an enormous, 120 m deep sinkhole – Mala dolina. This 130 m wide "hole" formed, when an enormous cave room collapsed. Reka flows over the bed of Mala dolina and disappears underground again – but just for a short distance. After passing though this natural bridge the stream enters in the next – even larger sinkhole – Velika dolina. This sinkhole is 163 m deep, 170 by 155 m large! Both Mala dolina and Velika dolina belong to the largest sinkholes in Europe, both formed hundreds of thousands years ago. Škocjan cave starts at the base of Velika dolina. Reka river has formed the world’s most impressive underground canyon inside the cave, which is 2.6 km long, 10 – 60 m wide and up to 146 m high. River in the cave forms some 30 waterfalls, which are up to 10 m tall. The flow of Reka changes according to the amount of water – from 0.03 m³/s to more than 380 m³/s, average flow is 9 m³/s. Far inside the cave river passes through a narrow site – siphon. At high water the stream can not pass through this siphon and the level of Reka rises in the cave. 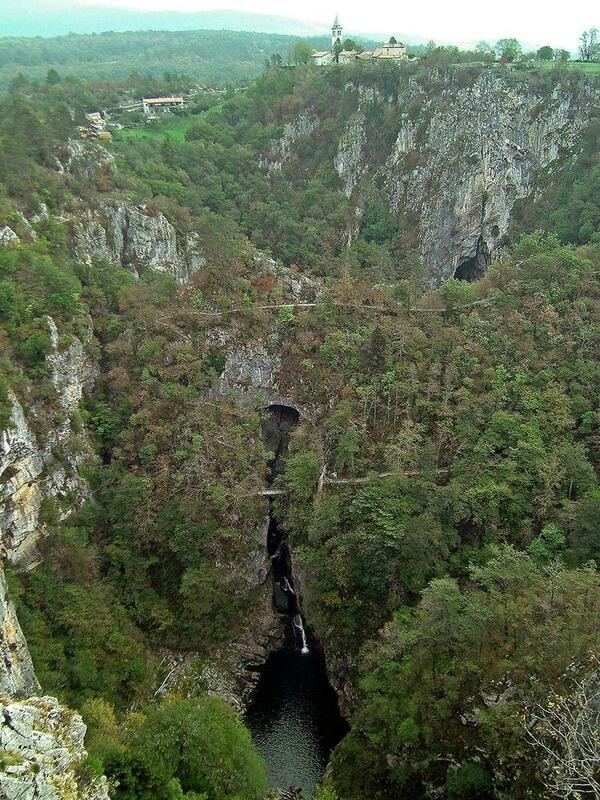 Rather deep in the cave a bridge – Cerkvenik Bridge – leads across the canyon (bridge is rebuilt in 2011). This construction is built 47 m above the river (at normal water level). But during the floods the level rises a lot. In 1965 the river rised 10 m ABOVE the Cerkvenik Bridge. Especially powerful floods were in 1826, when the river level rised for 128 m.
Great Hall with its giant stalactites. 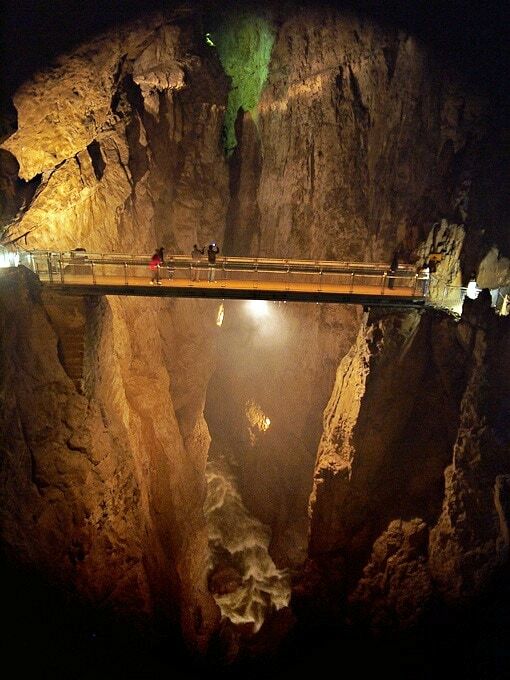 Here is located the largest known stalagmite of Škocjan caves – the 15 m high Giant. Hanke’s Channel (Hankejev Kanal) is 3.5 km long, 10 – 60 m wide and up to 140 m high passage. it includes the giant Martel Hall. Martel Hall (Martelova dvorana) – 2.1 – 2.2 million m³, 146 m high, 123 m wide and 308 m long. Siphon, which creates floods in the cave, is located at the end of this giant cave room. Organ Hall – cave room with stalactites, which form something similar organ. 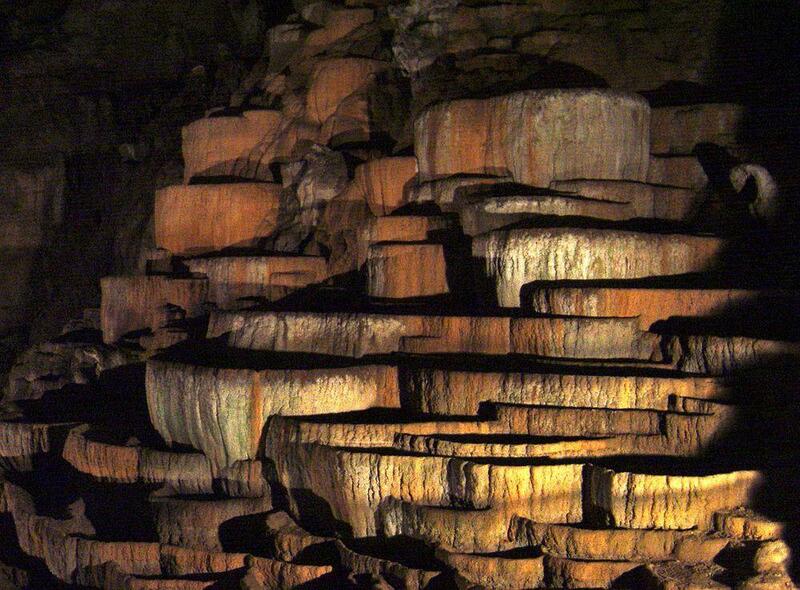 Paradise – place with beautiful flowstone deposits. Rimstone Pool’s Hall – cave hall with a rare formation – system of large rimstone pools. Numerous larger and smaller sinkholes have formed around the cave – such as Risnik (74 m deep, 540 by 360 m large, Reka flows 160 m below its floor), Globočak, Sokolak, Sapen dol, Lisična and others. The warmth of the enormous cave heats the ground of these sinkholes – and as a result in these sinkholes has developed very rich ecosystem with plants and animals characteristic for Central European, Mediterranean, Alpine and Illyrian ecosystems. Rare and endemic organisms live in the cave too, such as the unusual, blind amphibian – olm (Proteus anguinus), five species of bats are wintering here. Area around Škocjan caves has been inhabited by people for more than 10,000 years – from the middle Stone Age to the Iron Age. In the site of present day Škocjan was built a hillfort in the late Bronze Age, later here was built Roman fort and in medieval times – a fortified settlement. Giant sinkholes and Reka river disappearing below the ground most likely was seen as a gate to the underworld. 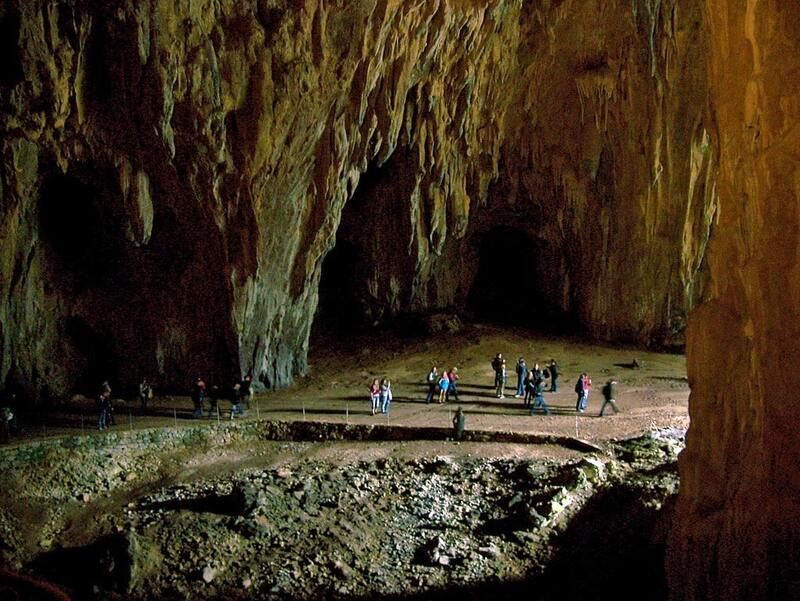 Škocjan cave was an important cult site of regional importance since prehistoric times. Thus a deep sinkhole – Velika jama na Prevali (Mušja cave) – served as a ritual sacrifice site in the late Bronze Age – early Iron Age (the 12th – 8th century BC). In the debris at the bottom of this sinkhole have been found more than 1,000 bronze and iron items: spearheads, axes, swords, helmets, shards of vessels. A necropolis from this same period is located below Brežec – here have been found 325 urn graves. Burials from the 11th – 10th centuries BC contain iron items, what means than iron appeared in Škocjan some centuries earlier than elsewhere in Central Europe. Brežec was used at the same time when the cult site of Mušja cave. Interesting landmark is located in Tominčeva cave – a stronghold inside the cave with 10 burial sites from the Bronze and Iron Ages. This place also has served as a cult site since the Bronze Age. The number of artefacts decreases after the 7th century BC – but activities around the cave continued. Thus, in Skeletna cave was found bronze vessel with early Venetian writing from the 4th century BC – the earliest text found in Slovenia. Poseidonius of Apamea mentioned caves in written sources around 60 BC, Škocjan caves have been mentioned in numerous writings in medieval times. This spectacular place was one of the most popular landmarks in this region. Development of tourist infrastructure started here early – in the late 18th century. First tourist trail was made in Velika dolina in 1819 (or earlier). Research of Škocjan cave started in 1839, in 1884 there was established speleology division to the Mountaineering Society of Trieste. By 1904 most of the cave was explored – further discoveries of new passages were made in 1991. Electricity was installed in the cave in 1959 and gradually there was developed some 3 km long trail, turning Škocjan caves into one of most spectacular show caves in the world. 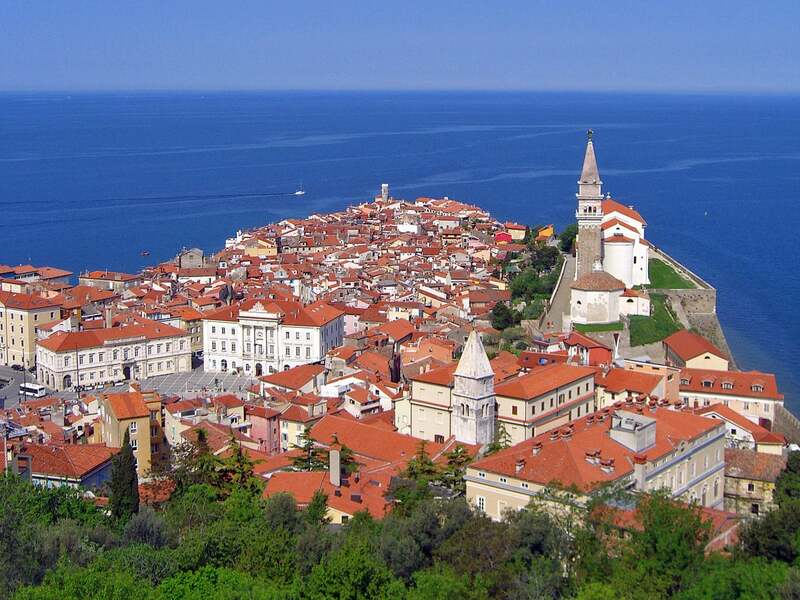 With this guide, you’ll explore charming towns and undiscovered natural wonders. Stroll atop the walls that encircle romantic Dubrovnik, wander through the Roman ruins in the heart of bustling Split, and set sail to the islands of Korcula and Hvar on the glimmering Adriatic. This book contains around 50 walks which bring the best of the Julian Alps to the English-speaking walker. The walks are based around five bases – Kranjska Gora, Bovec, Kobarid, Bled and Bohinj – all of which have a range of accommodation and public transport facilities.